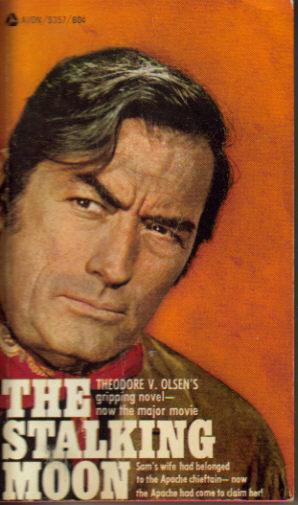 When I first came across this novel, I thought I remembered him being referred to as T.V. Olsen, so I wasn’t surprised to find that when I did a little research. Theodore V. Olsen was born and spent all his life in Rhinelander, Wisconsin. Born in 1932, he started his first novel while still in high school and finished it in college. HAVEN OF THE HUNTED was published in 1956. 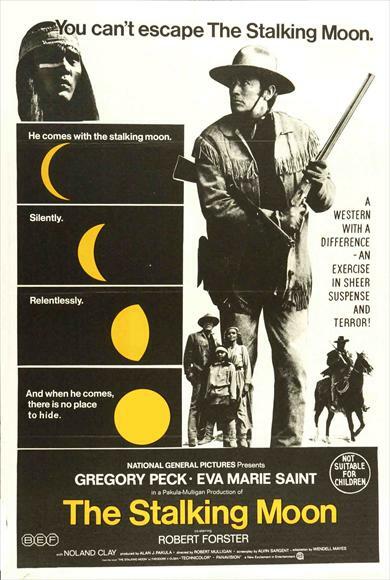 THE STALKING MOON came out in 1965 and was made into a movie in 1968 that starred Gregory Peck as Sam Varner, Eva Marie Saint as Sara Carver, and Robert Forster as Nick Tana. The paperback I have is the movie edition, a third printing in October. Sam Vetch had the rest of his life planned out. At thirty-seven, he was about to retire from fifteen years as an army scout, marry the woman he loved, and retire to the ranch he owned to raise cattle and a family. Of course things don’t always go as planned. Vetch was on one last assignment, accompanying a shavetail lieutenant whose troop was chasing down Apache tribes and returning them to the reservation. An early morning raid netted a surprise. A white woman was found among the women and children. Sara Carver, who’d been among them for ten years, taken in a raid on a coach. She’d been headed into the Southwest as a teacher for the Quakers, although not one herself. A second surprise was the two children, boys, a nine year old and one only a few months old. The nine year old is a stoic person, already imprinted with the Apache way of life. Two Apache are shot in the raid, a warrior killed by bullets from Sam and a sergeant, and a woman wounded. Sara says the warrior was her husband, the woman his other wife. Back at the fort, as he’s being mustered out, Vetch is asked to accompany the woman and her children to catch a train back East to the Quaker family she’d worked for years back, they having agreed to take her in. Before he leaves, his best friend, fellow scout Nick Tana, half Apache himself, tells Vetch he’s learned the man killed in the village was not her husband, but a brother-in-law of sorts. The real husband is a fearsome Apache named Salvaje, “savage,” a man feared by other Apaches. A man with a mean reputation in Mexico, where he spends most of his time, a man who enjoys killing Mexicans. He carries a Sharps buffalo rifle, a weapon with which he’s quite proficient. Some Apaches even believe he’s already been killed and can’t die again. His hatred of Mexicans comes from childhood when his village, a peaceful one that traded with Mexicans, is set upon by those Mexicans for scalp bounty offered by the new Alcalde. Salvaje scoops up his baby brother and manages to escape with a handful of others. No other members of his family made it out. One hundred dead Apache. Now he hunts Mexicans, slaughtering all he can find, down to children and babies, scalping them all, something few Apaches did. His marriage proposal to Miss Vangie Armitage, owner of the millinery shop is gently turned down. Miss Vangie likes him, but hates the west. She’d only come with her father for his health and now that he was gone, she’d been saving her money to return to New York City. With all his plans in disarray, Sam sees the trouble Sara and her two sons have with the “good” folks of town and hatches a new plan. he doesn’t love her and figures the same for Sara, but that would come. With new wife and sons in hand, he sets out for his ranch in New Mexico. Time passes and the couple get adjusted to each other. No consummation yet, Sam can see it in her eyes that she’s not ready yet. Then his friend Nick Tana shows up one day with disturbing news. the sergeant that had put one of the bullets in the brother-in-law is found murdered and scalped. Even more bad news, a family of Mexicans only a few hours away had been found slaughtered: mother, father, two sons, one a baby, all scalped. Sara reveals the Apache only cared about three things: his Sharps, which he constantly cleaned and oiled(and poured his own bullets), killing Mexicans, and blood kin. Both novel and film highlight the tension as Sam realizes Salvaje is acting like a cat, playing with his prey before the kill. The final third of the movie, directed by Robert Mulligan(TO KILL A MOCKING BIRD), is one tense chase and counter chase between Sam and Salvaje. This book is not as forgotten as I’d thought. As I was finishing this post, I found that Dorchester just came out with a new edition in April, part of their western novels into films series. It’s worth picking up if you haven’t read it. I give these guys A for effort and enthusiasm, if not style.